Cic Saor - In February 2001, Lord Paul Bew signed an employment contract between Ed Moloney, Anthony McIntyre and Boston College - why has he hidden this fact? In February 2001, Lord Paul Bew signed an employment contract between Ed Moloney, Anthony McIntyre and Boston College - why has he hidden this fact? Look closely at the two signatures below. One name is fairly obvious, because it’s also typed – “Ed Moloney”. The name that countersigns Moloney’s name is not so obvious but readers will see that they contain three initials and then the name “Bew”. 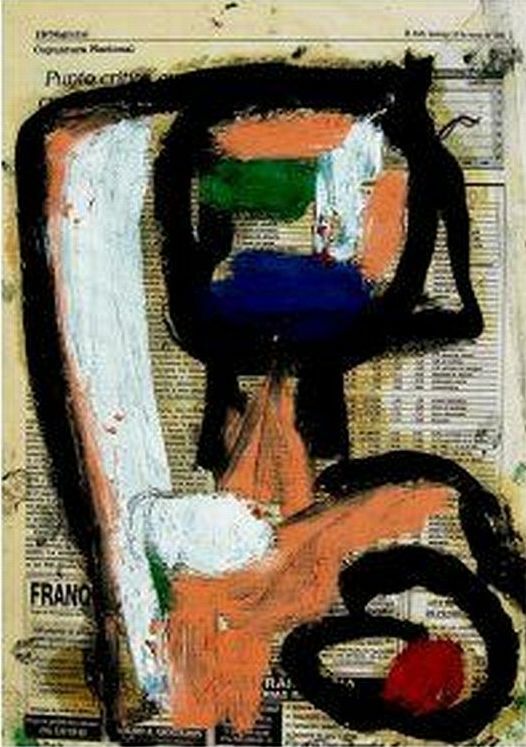 The initials are PAE or Paul Anthony Elliot and then the surname Bew. But what document is Lord Paul Bew countersigning here for Ed Moloney at the top of this article? 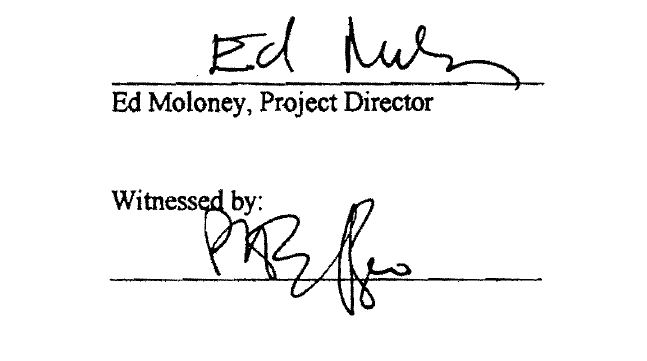 It is, in fact, a project contract between Boston College trustees and the journalist Ed Moloney to confirm the hiring of Anthony McIntyre as “Senior Lead Researcher”. Lord Bew is witnessing a terms of employment contract for Anthony McIntyre in other words. Needless to say this contract is of great significance given that Lord Bew has publicly denied recently that he had any real role in, what came to be known as, the Belfast oral history project. A project that is now accepted to be a sham enterprise completely lacking in academic or evidential merit. Lord Bew was visiting Burns Scholar at Boston college between 1999 and 2000 after which he implies above that he had no connection with Boston College and the infamous interview tapes. Yet here we have him countersigning a Boston College contract along with Ed Moloney in February 2001. Why, when Lord Bew was asked to sign this contract did he not, for example, simply decline to do so? He was well aware of the views of both Ed Moloney and Anthony McIntyre regarding Gerry Adams and the Sinn Féin leadership. At the very least, he might have asked for a broader range of interviewers to complement and balance Anthony McIntyre stridently anti Adams views. By agreeing to witness this contract Lord Bew is endorsing Ed Moloney, saying that he knows him well, and Moloney’s choice of Anthony McIntyre (Bew’s former PHD student) as the lead researcher. Now we find that Lord Bew actually signed a contract with Ed Moloney on behalf of Anthony McIntyre in February 2001. Yet Bew, to my knowledge has not mentioned this contract anywhere. A contract which casts grave, and fresh, doubts on Bew’s claim that he did not select Moloney for the project and had nothing to do with it. Lord Bew certainly doesn't mention this contract with Moloney and Boston College in his recent Sunday Independent article. Bew’s name on this contract also casts serious doubt on Ed Moloney’s claim that Bew was nothing more than a “messenger boy” in the Boston tapes project. Has Moloney ever mentioned this contract? Not that I’m aware of. Moreover, when in October 2002 (a year and half after he had signed the contract with Ed Moloney and McIntyre), Lord Bew wrote a scathing attack on Gerry Adams, whilst giving a glowing review of Ed Moloney’s book on the IRA in the Daily Telegraph, Lord Bew omitted to tell his Telegraph readers that he was a signatory to a research project on the IRA being carried out by that very same Ed Moloney. Just in case we don’t get the message in Lord Bew’s anti Adams diatribe, the headline for the article is – “At last we know the human cost of Gerry Adams.” The article in which Bew describes Adams as “smelling like a rotten cabbage” can be read here. Lord Bew is Chair of the UK’s Committee on Standards in Public Life and yet it is clear that, as a public figure, he has not been transparent with regard to his true role in the Boston fiasco. Moreover it is clear that he helped set in train a project not only completely lacking in academic merit but one that was also a “Get Adams” exercise that could yet destroy the Good Friday Agreement because of the flawed and corrupted interview process that Lord Bew set in train. Given what we now know, I cannot see how Lord Bew can continue in his role as the UK’s premier guardian of ethics in public life. The point about Bew witnessing a contract is extremely weak. Being a witness to a contract does not create any obligations at all. It ain't no smoking gun! Unless of course, you are saying that Paul Bew didn't know what he was signing, which is an untenable argument. If he did know what he was signing, he should have declared his participation in so doing. Nobody is looking for a "smoking gun" as you put it. This is not a murder trial. What Bew's witnessing of McIntyre's employment contract with Boston college shows is that he was invited to sign it by Ed Moloney or perhaps McIntyre, or both, and that he was aware that both of them were running what came to be the Belfast oral history fiasco. To our knowledge Lord Bew has never mentioned this contract. Title: In February 2001, Lord Paul Bew signed an employment contract between Ed Moloney, Anthony McIntyre and Boston College - why has he hidden this fact? Next entry: » The significance of Paul Bew’s name on Anthony McIntyre’s employment contract lies in the simple fact that he signed it.